Hölbling, D., 2019. Landslide research @ Z_GIS: Landslide mapping and monitoring using remote sensing. Presentation at "Lectures in GIScience: research progress and frontiers", University of Salzburg, Salzburg, Austria, March 18. Ferber, N., 2018. (Geo-) Partizipation, Citizen Science und mehr. GIS Day 2018, Salzburg, Austria, November 14. Hennig, S., 2018. How to make online geospatial participation as success? International Scientific and Practical Conference: Scientific - research work in the field of Geoinformatics: current state and prospects, Tashkent, Uzbekistan, 19-20 October. Junisbekova, V., Hölbling, D., 2018. SAR Interferometry and Object-Based Image analysis for landslide mapping in south-eastern Kazakhstan. International Symposium on Water and Land Resources in Central Asia, Almaty, Kazakhstan, 9-11 October. Hölbling, D., Tiede, D., Dittrich, D., Friedl, B., Reymond, C., 2018. Mapping and monitoring of mass movements around Öræfajökull: Examples, opportunities and challenges. Hekla, Öræfajökull & Remote Sensing Conference [Invited talk], Reykjavik, Iceland, October 5. Hölbling, D., 2018. Landslide mapping using remote sensing: examples, opportunities and challenges. Invited talk at the Department of Geography, University of Bergen, Norway, September 27. Hennig, S., Ferber, N. , Hölbling, D., 2018. Proseminar Citizen Science, Partizipation & Geomedien: Theorie und Praxis zur Entwicklung von Applikationen der Geo-Partizipation. Uni 55-PLUS Informationsveranstaltung, Salzburg, Austria, winter term 2018/19. Friedl, B., Hölbling, D., Tiede, D., Dittrich, J., Robson, B.A., Saemundsson, T., Pedersen, G.B.M., Lang. S., 2018. Object-Based Tracking Of Rock Avalanche Deposits On Glaciers Using Multi-Temporal Remote Sensing Data. 38th EARSeL Symposium: Earth Observation Supporting Sustainability Research, Chania, Crete, Greece, 9-12 July. Vogler, R., Hennig, S., 2018. GI Empowerment durch Erwachsenenbildungsinitiativen. AGIT - Symposium und EXPO Angewandte Geoinformatik, Salzburg, Austria, 1-5 July. Hölbling, D., 2018. Landslide Mapping. EO4Alps Summer School, Salzburg, Austria, 24 June - 6 July 2018. Tiede, D., Friedl, B., Hölbling, D., Dittrich, J., Robson, B.A., 2018. Object tracking through time: the example of a rock avalanche on a glacier. GEOBIA 2018, Montpellier, France, 18-22 June. Hölbling, D., 2018. Landslide research @ Z_GIS: Remote sensing based landslide mapping and assessment. Presentation at "Lectures in GIScience: research progress and frontiers", University of Salzburg, Salzburg, Austria, April 23. Dittrich, J., Friedl, B., Hölbling, D., Pedersen, G.B.M., Saemundsson, T., Guðmundsson, S., 2017. Towards the Compilation of a Terrain-Corrected Backscatter Database of Glacio-Volcanic Land Cover Types. Geological Remote Sensing Group (GRSG) 28th Annual Conference - "Applied Geological Remote Sensing", Lisbon, Portugal, 13-15 December. Hölbling, D., Friedl, B., Dittrich, J., Cigna, F., Pedersen, G.B.M., 2017. Combined interpretation of optical and SAR data for landslide mapping. 3rd Regional symposium on Landslides in the Adriatic-Balkan Region (ReSyLAB), Ljubljana, Slovenia, 11-13 October. Hölbling, D., 2017. Object-based Landslide Mapping: Examples, Challenges and Opportunities. Invited talk at Landcare Research, Palmerston North, New Zealand, February 13. Hölbling, D., Betts, H., Spiekermann, R., Phillips, C., 2017. Mapping landslide hotspots by means of historical and recent aerial photography on North Island, New Zealand. 17th ANZGG Conference, Greytown, New Zealand, 6-10 February. Fleischer, F., Otto, J.-C., Hölbling, D., 2019. Change of debris cover on glaciers of the Eastern Alps, Austria. EGU General Assembly, Vienna, Austria, 7-12 April. Ghorbanzadeh, O., Hölbling, D., Meena, S.R., Blaschke, T., 2019. Detecting Earthquake‐triggered Large-scale Landslides with Different Input Window Sizes Convolutional Neural Networks. EGU General Assembly, Vienna, Austria, 7-12 April. Hölbling, D., Friedl, B., Dittrich, J., Tiede, D., 2018. Remote Sensing for Landslide Investigation: Mapping, Monitoring and Modelling the Spatio-Temporal Dynamics of Land Surface Morphology. 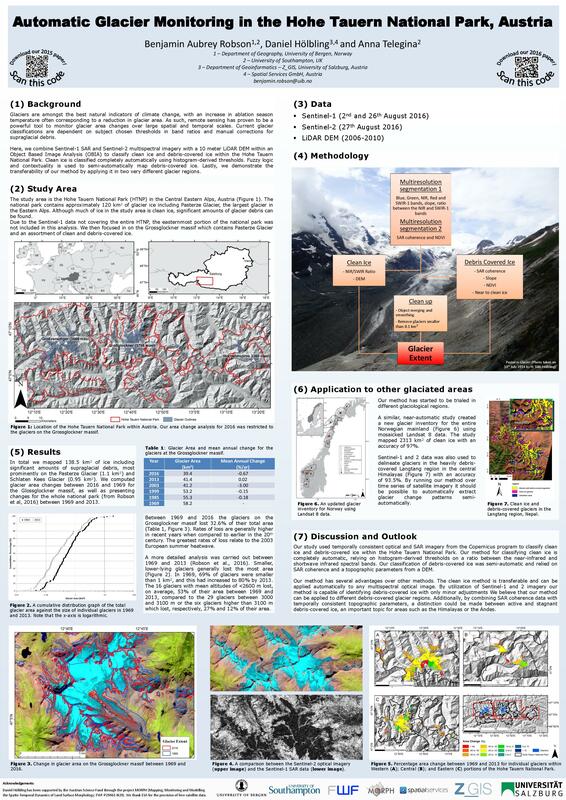 EO4Alps - The Alps from Space Workshop, Innsbruck, Austria, 27-29 June. Friedl, B., Hölbling, D., Dittrich, J., Tiede, D., Saemundsson, T., Guðmundsson, S., Pedersen, G.B.M., 2018. Delineation of rock avalanche deposits on glaciers from different remote sensing data. EGU General Assembly, Vienna, Austria, 8-13 April. Hölbling, D., Spiekermann, R., Betts, H., Phillips, C., 2018. Landslide hotspot mapping and susceptibility assessment in Pahiatua, New Zealand. EGU General Assembly, Vienna, Austria, 8-13 April. Robson, B.A., Hölbling, D., Telegina, A., 2017. Automatic Glacier Monitoring in the Hohe Tauern National Park, Austria. 6th Symposium for Research in Protected Areas 2017, Salzburg, Austria, 2-3 November 2017. Hölbling, D., Friedl, B., Dittrich, J., Tiede, D., 2017. Mapping, Monitoring And Modelling The Spatio-Temporal Dynamics Of Land Surface Morphology. 37th EARSeL Symposium: Smart Future with Remote Sensing, Prague, Czech Republic, 27-30 June. Aufaristama, M., Hölbling, D., Höskuldsson, Á., Jónsdóttir, I., 2017. Comparison of SAM and OBIA as Tools for Lava Morphology Classification - A Case Study in Krafla, NE Iceland. EGU General Assembly, Vienna, Austria, 23-28 April.